Nakul Ram Turi of Dudhwatol village in Jamua block of Giridih, Jharkhand, was among four people hospitalized after Bhumihars from the neighbouring village attacked them on polling day on the 10th of April, 2014, resentful of them voting for CPI-ML. ‘Hum log maarne nahi gaye teh, hum log vote dalne gaye teh. 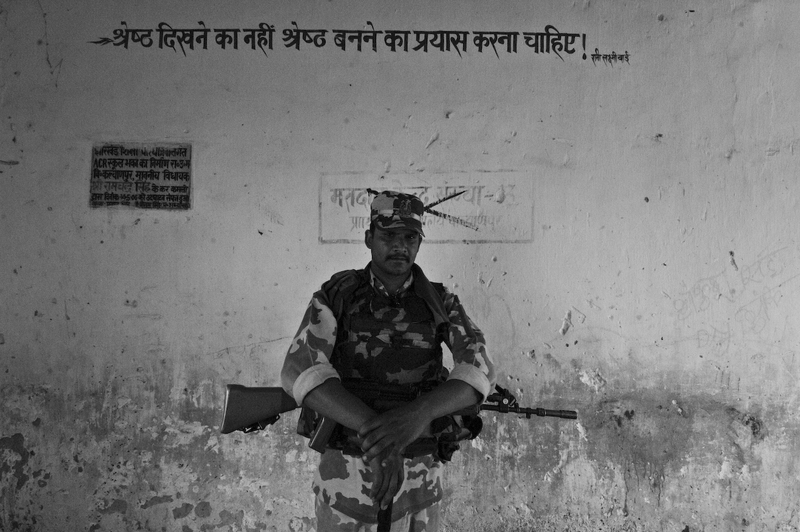 (We went to vote, not to fight)’ Said Govardan Rai Turi of Dudhwatol village of Giridih, where members of the Bhumihar caste had violently chased them away on polling day on 10th of April, 2014. It was at Booth Number 320 at Gardih village, in Jamua block of Giridih District, that comes under Koderma Lok Sabha Constituency, where on the 10th of April, 2014, the members of the Turi Dalit caste alleged that they were beaten up and chased away from voting by local Bhumihars, resentful of them voting for the CPI-ML. In the 2009 elections, Babulal Marandi, strongman of the Jharkhand Vikas Morcha, won 1,99,462 votes, with runner up Raj Kumar Yadav from the Communist Party of India (Marxist-Leninist) who gathered 1,50,942 votes. In this election, it is said that the fight is between JVM’s Pranava Kumar Verma and Rajkumar Yadav again, with a landscape littered with the red flag of stars of the ‘Maley’ as the CPI-ML is called in the districts, and the Bharatiya Janta Party, whose flags are on the larger more prominent homes off the roadside. Dudhwatol, a Turi famlet of around 30 homes, is a mere eight to ten minutes from the block headquarters of Jamua and I met two local journalists from prominent Hindi-dailies who had yet to report on the incident of poll violence a whole 10 days after. The village of Dudhwatol is a known bastion of the CPI-ML. In 1984, the villagers were moved to where they’re settled now after their liberation from bonded labour, which is still prevalent in parts of Giridih today. They recall with pride, one of their leaders ‘Basru’, who was with them in their agitations against bonded labour, and the right to land. ‘Basru’ or Ibnul Hassan Basru, was a member of the Communist Party of India who would eventually join the CPI-ML in 2002. He succumbed to cancer in 2009. As she would protest, the villagers allege that a Manoj Narayan Dev, a Bhumihar from the nearby village of Jiyotol, the Bhumihar para of Gardih, pushed Uma Devi away from the booth, apparently molesting her in the process. ‘Hum log agal bagal mein teh, aur woh chilane lagi, toh hum log bhagke aye. (We were nearby and she started shouting, so we ran to her)’Would say a witness to the incident. Just as an altercation started, a police vehicle arrived, where the villagers allege (was constable Ashok Narayan Dev, from the same village as Manoj), who started to lathi-charge the villagers from Dudhwatol. The villagers from the Bhumihar caste, both young and old, also began to attack the Turi villagers with sticks and stones. They started to beat Santoshi Turi, whose arms would be left swollen. And eight people would be injured, four would be hospitalized – Lakhan Rai, Nakul Rai, Govardan Rai and Rittal Rai, all with deep cut wounds on their scalps, that could’ve only been caused by stones. The next day, on the 11th of April, a day after a polling, over seventy people from Bhumihar-dominated Jiyotol would again enter the village and start ‘gaali-galosh’, much to the anger and chagrin of the villagers. The men gathered outside, confronting them. ‘Kya kya bole yeh log? (What did these people say? )’ I asked the group of villagers of Dudhwatol. ‘Sab ka haath-perr todd denge, haath kaath denge! ‘Aurat ko pakkad pakkad ke pitenge! The attackers would eventually leave after there were phone calls made to the CPI ML Block Secretary, Ashok Paswan who called up the Daroga, who went straight to a Mukhiya from Chorgotta Gram Panchayat, Upendra Singh. While Upendra Singh was unavailable to comment, Ashok Paswan recalls their conversation went on the lines of, ‘Hum aapne log ko samja lenge, aap aapke log ko samjalo. (We’ll handle our people, you handle yours)’ The mob would then withdraw, and have left an agitated and alert people on the lookout for further attacks. The Election Commission, while taking cognizance of 6 other booths where there has been booth tampering and the breaking of EVMs, claims to not have received any reports of booth capturing from Gardih, and the Superintendent of Police Kranti Kumar has marked the incident as ‘a conflict between two groups with a rivalry,’ and in a report to the Hindu, he has apparently ordered an enquiry. Suryanarayan Dev, one of the Panchayat Samiti members of Gardih, whose family the villagers of Dudhwatol explicitly accuse concur that there was a conflict on polling day, but it was the ‘Maley’ people, who were booth grabbing, who were harassing election officials, and chasing away voters, before the police arrived and lathi-charged them. He did not file any complaint with the election commission, or call for re-polling. An FIR was lodged in the Naodiha police station on the 11th of April of 2014, along with a counter-FIR by the Bhumihars. 100 young men from Dudhwatol were named to eight of the Bhumihars. Anup Turi points at land lying fallow due to conflict with the Bhumihars and the Forest Department. Land is central to the dispute. Dudhwatol is a village afflicted with migration to urban centres, to Delhi, to Mumbai, with countless young men recalling stories of working across the country. Many still didn’t return to vote, and many were informed of the attack only a few days later. Entering the village from Jamua one crosses vast expanses of grassland which is unaffected by farming, land that is apparently used by the Bhumihars as a grazing ground, and was abandoned from farming in 1984 once the Turi’s were settled there after their liberation from bonded labour. The other side of their village, is forest land devoid of any forests, except for a bamboo plantation, and land that was given to the Turi’s in the 1980’s; land whose ‘pattas’ (deeds), brown-tinted faded pieces of paper the villagers hold dear, but mean nothing to the Forest Department that has interfered with their attempts to farm repeatedly over the past few years. The Bhumihars claim that that was land given to them during the Bhoodan movement, and is still a Reserve Forest, although there is no sight of any trees, and the Turi’s point out cultivation in progress by the Bhumihars themselves. Beyond this disputed forest land, is a river that has still not run dry. Baldev Turi and his son Mantoo Turi and Ravinder Turi were in jail for 15 days, charged under Section 26 of Indian Forests Act in 2013. He was farming one acre and 20 decibel, and the Forest Department refused to acknowledge his patta. They sent him a notice to come to Giridih court again, by the 12th of April, 2014, and he refused to acknowledge the notice, saying it is too far and he doesn’t have the money and has to look after home. They continue to work with CPI ML in a struggle for land, and to return their lost land over the past few decades, which has also been taken over by the Bhumihars. The few houses built in the village through the Indira Awas Yojana were built after the Panchayat took Rs.10,000 from the families, in contravention of its rules. Once a village that used to vote for the Congress, and once where the labour was worth two kilograms of rice, it is now evident to all of them that there is an excess of land in their vicinity. 10 days after the incident, the village prepares for a wedding. Young boys run around in excitement, two old men play the dhol, while women sing songs, dancing slowly to the jhumka. The young men of the village set up scaffolds and cook in the centre of the village. Beby Turi, aged 18 from Dudhwatol met Rajnish Kumar Turi, aged 20, of nearby Kurobindo village, during ‘chowkidaar’ training, or police training, and are getting married on the 20th of April, 2014. The threat of further attacks by the Bhumihar villagers has dissipated but a sense of anxiety prevails. ‘Hum log ka bharosa hai ki Maley walley hamare saath hai. 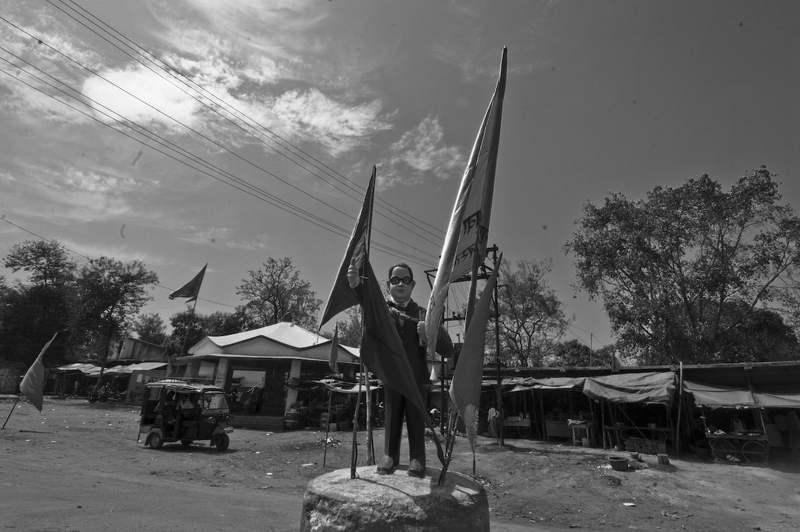 (We trust that the CPI ML is with us)’Said one of the village elders. But it becomes quickly evident that they are all 30 minutes away, and that the villagers are on their own in the event something would happen. They all know about Bathani Toli, they know about Laxampur-Bathe. ‘Yeh Bhumihar log kabhi sudrenge? (You think the Bhumihars will ever improve? )’ I had asked after a tirade after tirade on tales and tales on daily abuse, threats, from all their Bhumihar neighbours. The question elicited muted laughter and jitters, and a ‘Nahi sudrenge (Never)’ from amidst the crowd. ‘Ha leader log hai, (Yes, there are leaders)’ said one, man. ‘Ha, aur Sunil Ji hai. (Yes, Sunil is there)’ Said a villager elder. Everyone’s attention moved towards a middle-aged man with a crew cut, sitting quietly in the corner. His name is Sunil Singh, he is a Bhumihar from the same village Gardih and a cadre of the CPI-ML. ‘Inko bhi target kiya hai. (They have targeted him too)’ Said a village elder for an embarassed Sunil Singh. ‘Aur insaf peh yeh log roziroti, mazdoori kamane walle log he, aur aap ke pas kaam kar rahe hai, aur aap log ko job hai, das baara bigha zameen hai, aap paise walle hai, yeh log aapse takkar nahi kar sakte hai. Sau rupiye kamake yeh log kitna ladiaye karenge? ‘Aapke gaon walle aap ko kya bolte hai? (What do your fellow villagers say to you? )’ I asked Sunil. On wedding day, most of those who lived on daily labour had returned mid-afternoon, the sounds of singing would mute as a loudspeaker would begin to blare popular songs. Lunch was served to all the visitors, journalist, Bhumihar or ‘Maley’. The conversations over voting were secondary, it was land, land and the marriage on everyone’s mind. At the day of counting on the 16th of May, 2014, the CPI ML’s Raj Kumar Yadav was trailing the BJP’s Ravindra Ray by a handful of votes throughout the day, but would eventually lose by a margin. BJP won with 365,410 votes, with CPI ML coming in second place with 266,756 votes. JVM came third with 160,638 votes, Congress came fourth with 60,330 votes, and AJSU with 25,522 votes. A Marxist Coordination Committee party office in Wasseypur, Dhanbad of Jharkhand. There are 17 independent candidates and 15 party-affiliated candidates in the Dhanbad-Bokaro Lok Sabha seat in Jhakrhand, which went to the polls on the 24th of April, 2014, where there were often long queues. Before polling day, there were more makeshift election offices in Muslim-dominated Wasseypur in Dhanbad than there were schools, health centers and anganwaadis. When you enter Wasseypur’s main road before polling day, it was carnival season. Every party, from the Congress, the Jharkhand Vikas Morcha, the Trinamool Congress, to the Marxist Coordination Committee have two to three to four or five makeshift offices, one after another, opposite one another, with of course the exception of the Bharatiya Janta Party, who’ve just put up their flags, and the Aam Aadmi Party, who has no visibility. All cramped, competing for space, and in every other moment another party vehicle passes by blaring songs and exhortations, trying to win the favour of the Muslim voter. One boy kept getting the third part wrong, ‘Agar acha candidate nahi milta to? (What if there are no good candidate?) ’ Asked a teacher. Speaking to the mini-meeting of the women from Wasseypur, all from BPL families, they had no idea about who their incumbent candidate was, or who was going to win, or anything about this ‘Modi wave’. They did not know that Lok Sabha Minister Pushpati Nath Singh from the BJP, won the previous elections with 58,047 votes defeating second place Chandrashekhar ‘Dadai’ Dubey of the Congress (who is now running on a TMC ticket), nor did they know that their Congress candidate is Alok Dubey. Nor did they know who was AK Rai, a charismatic Marxist trade unionist, three time MLA, and three time MP from Dhanbad, who is responsible for the organized coal miners in Dhanbad to earn around Rs.40,000 to Rs,60,000 a month, who’re the only miners in the country who talk about the stock market while having their chai breaks. AK Rai, is today in the twilight of his life, who still managed 85,457 votes in 2009 without campaigning for a single day, with the rumour that his election campaign budget was Rs.25,000. He was recently in the news (or minimal news), after dacoits had robbed his landlord’s home at Noondih village, in January, taking Rs.2,600 and his prized HMT watch, literally making him bankrupt. He responded that they were probably ‘more needy’ than he was, and it is a known fact that he had refused the Minister’s pension, advocating that none should ever receive one. This year though, Israr Khan, a trade unionist in the Footpath Rozirote Parjan Sangh, himself from Wasseypur, is confident that the new generation of the Marxist Coordination Committee, with teacher/organizer/farmer Anand Mahato, as their candidate, along with support from the Nitesh Kumar’s JD-U, is going to challenge the big powerhouses who’ve written off the Marxist Coordination Committee. Anand Mahato, 68 years old, has all those criminal cases to his name, that a leader of people’s movements against displacement has, from sedition to obstructing public servants to rioting; most relating to the shutting down of the Sindri Colliery where 10,000 workers were kicked out of their jobs in the year 1995-1996. He was the sitting MLA from Sindri during the confrontation with the CCL, and was even imprisoned for ‘andolan’ activities. Israr Khan, or ‘Mister Khan’ as he is known, used to be a Congress worker until the party was responsible for the demolition of countless shops on the streets of Dhanbad in 2004. He joined the Marxists eight years ago and is obviously one of the reasons there are countless red flags in Wasseypur, competing with Saffron, the Tiranga and the Yellow-Green of Jharkhand Vikas Morcha. ‘Joh log thode samajdaar hote hai, woh Marxvadi soch mein aa jaate hai (Those people who are a little intelligent end up believing in Marxist ideas)’, he responds to the question of acceptability of Marxism amongst the Muslims of Dhanbad, who’re visibly more affected by the Mafia than by the Marxvadis. In their election offices in Wasseypur, almost all the people who’ve moved towards the MCC, are disgruntled ex-Congress workers or ex-JVM workers, or unorganized workers, who’re visibly angry with both the Congress and the BJP, and the lack of development in the area. Israr Khan has himself been making efforts to build a base amongst the Muslims of Wasseypur, to add to the MCC base of coal miners, displaced populations, safai karmacharis and adivasis across Dhanbad and Bokaro district. Their mandate has displacement first, and then corruption, communalism and inflation, and with countless coal mines in the district, and lands that are meant to be returned to the adivasis, there is a strong belief amongst them that the party will do well in the coming elections. On the 14th of April, over 5,000 people had congregated in a MCC public meeting for a shahadat divas for Gurudas Chatterjee, an MCC MLA who was murdered by the coal mafia in 1998, (the meeting was of course reported by no local media except Hindi-daily Prabhat Khabar). In Wasseypur, the Muslim votes are divided. While all parties are confident they will get the Muslim vote, the residents mostly grumble about their roads where cars driving through stumble like drunks, or could stare down chasms like suicidal stock brokers. The famed mafia on the other hand, are just neighbours people don’t really want to talk about. ‘Faheem boss’ from Gangs of Wasseypur fame, has been a part of the Congress-led INTUC is currently in prison along with his next-in-line son, Iqbal. In the Congress office, everyone claims they’ve always been with the party and their response to the media’s coverage on scams after scam committed to Congress governments, on ‘ghotala (scams)’, was that ‘ye sab gumrah kar rahe hai (They’re all misleading us)’. They seemed to have more trust on the Congress’s efforts to reduce ‘mehngai (price rise)’ and that their other main issue was articulated repeatedly as ‘sukoon (peace)’, indicating their reservations about Modi coming to power. ‘Media hi sabh chalarahe hai, Tv kholiye subha, Modi, shyam ko kholiye, Modi. Aare aage koi hai! (They’re running the media, turn on the TV in the morning and Modi, turn it on in the evening, Modi. Is there anyone else? )’ Exhorted another Congress supporter. ‘Teh na! Teh! (He was, no! He was. )’ He replied. He would continue to add what is spoken across Wasseypur. That no one knows who is Alok Dubey of the Congress, and the Congress should have just fielded Daday Dubey, who the voters of Wasseypur know, and have voted for in the past. That he had taken the TMC seat, ensures that the vote would split for both parties and would have no chance of defeating BJP, thus everyone should come to JVM, said Mr.Kalam Khan. A sentiment found in Congress supporters too. Across the day, it was becoming more and more evident, that every individual felt a need for Wasseypur to vote together, but there was a ‘batwara (division)’ of votes, and an anxiety in many people, unsure of which party has the strentgh to defeat the BJP, a sentiment found amongst the majority. But without any unity, without any political party working to organize the people of Wasseypur on their own terms, there would be no collective mass, and what is a voting base, is merely a supermarket for votes. ‘Muslims look at how the elections are going, which party is strong, and then vote en masse towards that party,’ say many observers of Wasseypur, but at an independent meeting held on the 21st of April in Wasseypur, the only consensus was that there is no consensus. The election results on the 16th of May, 2014, showed BJP’s V.N. Singh winning with 543,491 votes, followed by Congress’s Ajay Dubey with 250,537 votes and Anand Mahato from the MCC with 110,185 votes. JVM’s Samaresh Singh got 90,926 votes, with Chandrashekhar Dubey of TMC with 29,937 votes. 118,826 votes were then divided between All Jharkhand Students Union, Aam Aadmi Party, Jharkhand Party, Jharkhand Disom Party, Samajwadi Party, Bahujan Samaj Party, etc and the many independent candidates. The polling booth at Mayapur, Palamau District of Jharkhand on the 10th of April, 2014. Constants seldom make election campaigns, and election results seldom challenge them. C for Corruption but then it is C for Caste, Counterinsurgency and Contrator-raj, that are constants in Palamau district of Jharkhand, and then there is C for cynicism: the language, religion, and soul of every voter, whether he believes in Modi or not, in Laloo or not, who knows things will seldom change in the village, no matter who will win the election, where this time an incumbent ex-Maoist is finding his challenge in an ex-cop and an ex-minister. Palamau and Garhwa (Constituency Number 13) is meant for the Reserved Category. The sitting Minister of Parliament Kameshwar Baitha was once a part of the Naxalite insurgency, who won the 2009 seat on a Jharkhand Mukti Morcha ticket while serving a jail term. In the previous election he lost to Ghuran Ram of the RJD by a mere 22,327 votes. It is common knowledge that he joined the CPI Maoist (Party Unity) after the Arwal massacre of Jehanabad on the 19th of April, 1986, where 21 members of the leftist Mazdoor Kisan Sangarsh Samiti were killed by the police. But even by asking 267 questions in parliament, his popularity in the region had waned dramatically in the past five years. He was eventually ditched by the JMM and is currently standing with a Trinamool Congress ticket, after failing in his attempts to win the favours of the BJP, who would eventually field ex-Director General of Police, Vishnu Dayal Ram, a 1973 batch IPS officer, who was the Superintendent of Police during the infamous Bhagalpur blinding incident of 1979-1980, where 31 undertrials had acid poured into their eye sockets by the police. Yet touring the districts of Palamau and Garhwa it is almost unanimously agreed that the battle is between the RJD’s Manoj Bhuyan and BJP’s V.D. Ram for whom the recent Ramnami celebrations on the 8th of April, and the Modi factor is helping to push votes towards him, especially amongst the landed, dominant and forward castes. Manoj Bhuyan, has a mixed consolidation of Yadav, Bhuyan and Muslim votes. When Palamau and Garhwa went to the polls on the 10th of April, 2014 in the first phase of elections in Jharkhand, 1,417,375 voters were meant to practice their franchise but a mere 59.3% showed up for polling. The M factor, wasn’t as much as the Maoist boycott as the Mahua factor, that during the last few days of the fruits falling onto the rich earth, adivasi villagers whose sole source of income for months would be Mahua, would only want to vote after they collected their quota of Mahua for the day, but polling ended at 4 in the evening, leaving many out of the process. At empty polling booths, disgruntled security personnel were annoyed at how villagers would rather pick up mahua than vote, obviously missing out how the world’s largest democracy could be a farce. ‘Ka maloom kisko vote diya (Who knows who I gave my vote to? )’ Said an old man who came alone and walked away with sheer disinterest in the polling booth at Uldanda Panchayat at Palamau district. A young man, ‘a good samaritan’, held his hand to make him vote, and he wasn’t the only one to whom the act of voting is a mere habit, a connection to this invisible ‘sarkar’, and nothing else. Another man with his grandson under a Mahua tree in Chainpur block, would rather ask journalists who he should vote for, and who we think will save the nation. Suryabed Devi from the village of Dorami would find her name would not be on the list, and would visit the polling booth thrice in the day to try and vote for ‘sarkar ke niyaam’ (government schemes). When she was asked by an observer from Delhi if she knew the ‘Jhadoo wala party’, she responded that she knew what a ‘Jhadoo (broom)’ was. Over 25 kilometres away, a BJP polling agent, sat around a coterie of 20-30 villagers near the empty Mayapur polling station in Chainpur block of Palamau, distributing election papers with their serial numbers, to make it easier for voters to find their names on the roster. On the first question about the ‘samasya (problems)’ of the village, ten people would all start to speak as once, talking about pani (water), bijli (electricity), ration and job card while the polling agent kept quiet. They were a divided bunch with no one clearly espousing support for any party, with some voices invoking the ‘Lantern’ and others ‘Phool’ (lotus), while there was unanimous mistrust towards their incumbent minister Kameshwar Baitha. ‘Aap abhi bharosa kaise rakhege? (How can you trust them now? )’ I had asked the group. ‘Gaon ke samasye mein badal aayega? (Will the village’s problems get fixed? )’ I asked. Then a cacophony again. Mostly saying no. The polling agent kept quiet. He didn’t wish to speak anymore. Speaking to villagers after villagers, there was an obvious sense of abandonment, of the village, of the self, of the community amongst a majority of people who went to the polls. Yet there were some places where the issues were not issues, and the struggles were entirely their own. 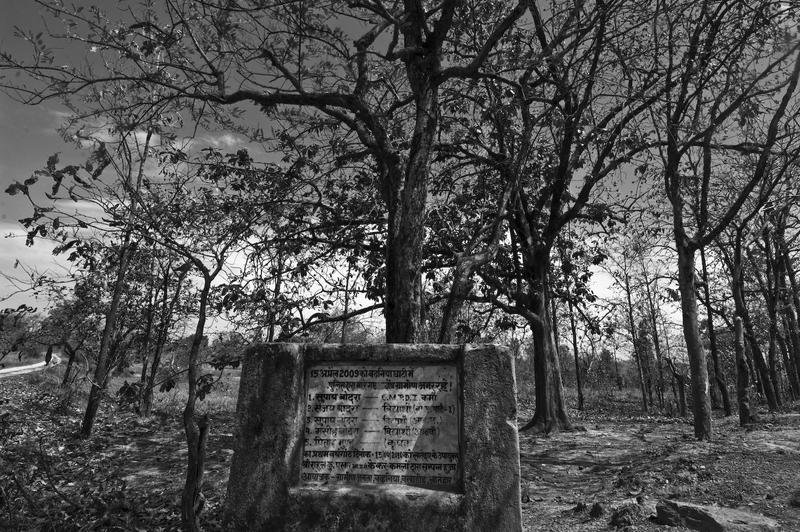 Memorial for the dead at Barhania village in Latehar District of Jharkhand. Around 55 kilometers from Palamau, it was in Barhania village in Murvai Panchayat in Latehar district that on the 15th of April, 2009, a day before polling for the Lok Sabha elections that an IED blast on a polling party, would claim the lives of two CRPF personel and one civilian driver Vijay Kumar Prasad. And in an act (that is always disputed by the police), that can only be described as a revenge killing, the angry CRPF survivors marched to the nearest village and arbitrarily killed five people – Supay Bodra (18), Sanjay Bodra (20), Masi Soma Bodra (14), Pitai Munda (32) and Supay Bodra (55), and claimed they killed five Naxalites. The incident on the peak of the elections, led to a frenzy of accusations, anger, and promises, and the fact that the village, has contributed 17 people to the Army or the Border Security Forces or the Jharkhand state police or the CISF, and is then branded a ‘Naxalite village’, did not escape public scrutiny. Army Jawaan Joel Budra, whose own family members were killed on that day, would eventually leave the Bihar Regiment a few years after the killings, and still remembers the day his own colleagues who saw the news bulletins, started to insinuate that he comes from a village of ‘ugravadis (extremists)’ . ‘Abhi bhi yaad aata hai unka (I still remember them).’ He says about his family members, he himself is almost half his size today, and spends his time working in the fields when there is work. The site of the attack today is dotted with two memorials, one for the driver killed in the attack set up by the transport association, a statue of stone whose ankles are beaten down and another by the villagers of Barhania with the names of the villagers and details of the incident that clearly indicts the CRPF. Over the past few years the CRPF patrols have constantly erased ‘CRPF’ from the plaque, and the adivasis keep writing it again. Jawaan Mangram Munda, who is part of the CISF categorically states, that the villagers were innocent and that the massacre wouldn’t have taken place if he was there in the village the day of the attack. He was himself at Chatra at election duty, and is visibly angry with the CRPF who acted rashly but has an entirely different relationship to the state than others in his village, and is openly espousing his support for the AAP in Latehar on the issue of corruption, even though there is no visible sight of the party across the region. On the day of the killing, every political party from the Jharkhand Mukti Morcha, to the Jharkhand Vikas Morcha, to the Bharatiya Janata Party, to the Rashtriya Janata Dal, the CPI(ML)-Liberation, and Communist Party of India, to human rights organizations and the national media would visit the village, whose lack of irrigation facilities had affected migrancy and livelihood as much as the massacre. In 2009, the families of the victims would never go to the polls, and five years later, their voices stand divided, with some still refusing to vote, and some believing they would vote for the Congress’s Dhiraj Prasad Sahu, who had given each of the families Rs.20,000 as compensation, and has promised to re-open collieries, re-open the Chirimiri railway line and to complete the Mandal Dam which will drown countless trees and submerge villages, to the chagrin of other adivasi groups. Their incumbent candidate, Inder Singh Namdhari, who ran as an independent, only visited the village once, and had called for a review into the incident, when the villagers was already cleared by then. ‘What if there was a complete gaurantee that the water problems in the village would be solved if you voted?’ I asked. Migrant workers returning from Bangalore an evening before polling day. During the Mahua season, the Munda, Oraon and Chero adivasis of Palamau-Chatra-Garhwa and Latehar collect as much Mahua as they can for their home, and sell what they can in the market. The markets are run by ‘Mahajans’ with whom there is no bargaining over price. It starts at Rs.30 per kilo, and over the next few weeks as more and more trees grow mahua fruits, the price goes down to Rs.25, to Rs.20. Then, in a few months, the Mahajans will sell the Mahua back to the adivasis at Rs.40 or Rs.50 a kilogram when there is none left in the forest. A system in place for there is no organized effort by the government to build godowns, or to protect adivasi interests. In every village moving towards the interior, incomplete roads, incomplete government buildings dot the landscape. In every conversation, there was always someone or the other from Daltonganj or Ranchi, from anywhere but here, who built half of a road, or half of a building, or nothing at all. It was in Latehar, where on the 2nd of March, 2011, where the CPI Maoists, in collusion with a contractor had murdered Niyamat Ansari, an activist fighting for proper implementation of MNREGA, who built a pond through a government scheme in the panchayat, who repeatedly invoked the RTI act and the Forest Rights act. The local Maoist commander Sudarshan would accuse him of stealing land, stealing from the poor, ‘child sacrifice’ but would eventually be forced to ‘apologize’ by his leadership. Another incident where the role of the contractors is pushed to an afterthought took place in Garhwa, when an IED blast on the 21st of January, 2012 had claimed the lives of 13 police personnel, who were accompanying the local Block Development Officer Vasudev Prasad to a protest site at Bargad, where villagers were protesting against how their health center, meant for the village Ghotoni was being built at Bargad by the contractors in collusion with the dominant castes. At the same time, the CPI Maoists had abducted Zilla Parishad member Shushma Mehta of the CPI-ML, her bodygaurds and party member Akhtar Ansari who were also on their way to the protest site, while the police lathi-charged the protestors at Bargad, refused to acknowledge that Sushma Mehta’s team was abducted and would go on to accuse that the attack on their polling party was planned by the CPI-ML. The team would eventually be released by the Maoists and Sushma Mehta herself is now vying for the Palamu-Garhwa Lok Sabha seat. And the contractors never built the health center meant for Ghotoni. The BJP campaign itself found its feet in Shyam Narayan Dubey, a contractor who also runs the teachers union through the Bharatiya Mazdoor Sangh, Manoj Singh, District President of BJP also a bus contractor with murder cases to his name, Parsuram Ojha, a contractor and social worker, Kiran Singh, another bus contractor, and from Ranchi, Harihar Singh and his brother Pancham Singh, who are into construction. For the RJD there is Girnath Singh who is a ‘zamindar’, Someshwar Sahu who is a bus contractor and Congress worker who is supporting the RJD this time around, and the family of political strongman Bishma Narain Singh, a once governor, minister and MLA, and many more. Ghuran Ram, a candidate from the Jharkhand Vikas Morcha, is himself a contractor. This is an endless survey meant to be, on how each contractor and zamindar in every region moves towards some political party or the other, or both, to try and make use of the Minister’s fund. Today, with the onset of neo-liberalism and the breakdown of unions, contractors in the region have now also found dealing in human beings a profitable business. The evening before the polls, nine migrant workers from the village of Regeniya in Barwadih block had paid Rs.3000 to a tempo driver to drop them from Ranchi to Daltonganj, as there were no bus services available as they were all taken for election duty. They had just returned from Bangalore, and one of them believed that if you don’t vote, they cut your name out of the voting list. They were ambivalent about their reasons for returning, until the next day they called up to say that they had run away from Bangalore after two of them were almost killed in a construction accident. It was a local contractor from their village Rehnai Singh who had sent them with some money to work, at the JMC projects in Bangalore, where a contractor Munna Khan put them to work along with construction supervisor Rehnai Singh’s son, who had locked them up, abused them, and refused to hear their concerns of safety after the accident. They escaped clandestinely but were caught on the road by the contractors who threatened them with dire consequences. ‘Hum bezati ka kaam nahi karenge (We won’t do work that dishonours us)’Repeated Prakhar Singh, a Cheroo adivasi, around 21 years of age. On the day of polling, when one of the migrants said they had voted for the BJP, a group of villagers and activists started to chastise him, asking how they were treated by the locals in Bangalore in where they had gone to work: ‘Aap ne unka hi sarkar ko vote diya, (You’ve voted for the same government)’ Said Kanhai Singh, an adivasi leader and CPI-ML cadre, ‘Aap Bhajpa ko vote diye hai kyuki aap Hindu hai? (Did you vote for the BJP just because you’re Hindu? )’ He would ask them. ‘Ha, toh Kangi kaun cheeze hai? (Yes, so what is a Kangi? )’ said a worker, to jitters. It seemed nobody forgot that Babulal Marandi of the ‘Kangi’ was once a part of the RSS, but as the conversation grew more and more redundant, one worker expressed that he is ‘un-padh (uneducated)’ and doesn’t know these things. In the evening, the contractor who ‘sent’ them to Bangalore to work, came to collect his dues. The visibly frightened workers had no choice but to accept that they have to return the debt they owed Rehnai Singh, but refused to file a case for what is legally bonded labour. Ram Navmi Flags on the statue of Dr. Ambedkar in Latehar district of Jharkhand. Kachanpur village in Chhattarpur block in Palamau district is a village split between Dalits and Jadhavs, has access to a pond, an MNREGA office, with the ‘N’ rubbed out, and villagers who see the sense of humour in ‘marega ka kaam (the work of those who will die)’. Of 1,100 voters, only 30% would practice their franchise, since most of the village youth are also migrant workers in other cities, who did not return to vote. The villagers also recall with laughter at how the BJP was giving out Rs.4000 to the voters, and the Jharkhand Vikas Morcha was first giving out Rs.500 and then was forced to give Rs.4000 due to competition, but eventually their party workers reached a compromise and realized they should both just give Rs.2000. The villagers unanimously voted for the Bahujan Samaj Party’s Rampati Ranjan, but those that belonged to the Paswan caste, had their votes split for the BJP due to Ram Vilas Paswan’s move towards them. 41 year old Raghu Ravidas is a teacher in a local school who has belonged to BAMCEF (All India Backward (S.C., S.T., O.B.C.) And Minorities Communities Employees Federation) for decades now, recalling how it was Baleshwar Bharti, now from the BSP who had worked with them for decades. Today, his school building ran out of funds, since a portion was paid to the contractors, another fee had to be paid to the CPI Maoists and when the anti-Maoist Tritiya Prastuti Committee would arrive to ask for their own ‘cut’ there were no funds left, and the work for the school was forced to shut down. Raghu Ravidas, remembers the conflicts in his village over caste, and how his people were humiliated at a Jadhav wedding by being asked to clean their own plates. A matter that was settled when they threatened wholesale boycott and when the then Maoist Communist Centre had a meeting with the Jadhavs. He even cites the humiliation of a government teacher Alok Deo Ram, a Dalit who was forced out of the school at Nodiya Bazaar after the other teachers who belonged to forward castes couldn’t deal with their own resentment. ‘Chapal ka mala pina diya tha unko, (They made him wear a garland of slippers)’ Said Raghu Ravidas, who along with BAMCEF were on the forefront of the protest, with hunger strikes, marches and protests outside government offices. 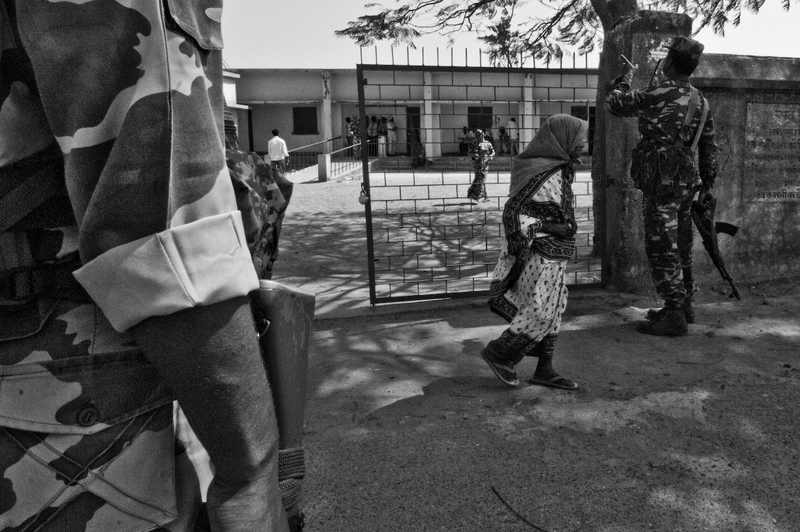 This followed another incident in nearby Tilliyadi in 2003, where the members of a Teli Caste refused to send their children to a school for the cook belonged to a lower caste. While the BDO had ensured a case was filed, the woman in question left her position due to further harassment. ‘At that time, Ghuran Ram, from the RJD, and a man from our own caste,’ Said Raghu Ravidas, ‘said that the other teachers who humiliated Alok shouldn’t be arrested.’ None of those who were part of the government machinery, who won the seats that come under a reserved category, had come to the protest and the struggle that was held by the BAMCEF. Further irritation was reserved for MLA Sudha Choudhary of the JDU, who herself from the Pasi caste had a ‘mixed marriage’, whose response to protests was also lukewarm. When I had asked Raghu if the constituency being in the reserved category had done anything to annihilate ‘jaat-vaad (casteism)’, his response was an astounding no, since no party in power was a part of any of the grassroots work that was being done. It became obvious that caste plays a role in where the votes can go, but in a constituency that comes under a reserved category, the annihilation of caste is not a candidate’s primary concern. It was more than evident that the BSP had given them a sense of self-respect that no party had done, an identity, and a voice, and it was clearly elucidated with how a tone of 30-40 women sitting in a mini-panchayat would change, as they talk with rigour, laughter and pride when there is any conversation about Behenji. The opposite sense was with the Ansari Muslims of Chegona in Palamu Constituency, who had unanimously voted for the RJD since 2002 after the Loto massacre in their Panchayat where 12 people were killed, some say the perpetrators were the RSS, while others say the MCC, and some say by the Maoist-faction People’s Liberation Front of India. Both Rabri Devi and Laloo Prasad Yadav had visited the Panchayat (of Chegone, Loto, Arar and Khodi) on the day of the attack itself, and the memory and gratitude of a people who’ve never been organized, has turned votes to an afterthought. They come under the Khodi Panchayat which is predominately Yadav, who were happy to tell the Ansari villagers of Chegona, ‘Hamare dono haath mein ladoo hai, RJD bhi Yadav ka party hai, aur BJP bhi Hindu ka party hai. (We have sweets [ladoos] in both hands, RJD is the party of the Yadavs, and the BJP the party for Hindus)’.Their own ‘Mukhiya’ would be a BJP party worker and a contrator, Ranjit Kumar Jaiswal. ‘Usne kya vikas kiya? (What progress did he bring us? )’ Asked a middle aged man in the mini-panchayat, ‘Usne hamara saab chawal bhej diya! Bahut vikas kiya! (He sold all our rice. So much progress! )’he said to laughing old women and young boys. While they say there is no fear of Modi coming to power, to them and their village, there is a fear for over 40% of their young sons and brothers work as migrant workers in cities across the country. The RJD to them, had not done anything to them, but they voted for them. There are political parties you vote for, and/or political beings you become. On the 16th of May, 2014, the results showed that at Palamau Lok Sabha Constituency, the BJP’s V.D. Ram won with 476,513 votes, followed by Manoj Bhuyan of RJD, with 212,571 votes, to JVM’s Ghuran Ram with 156,832 votes and Kamleshwar Baitha on a TMC ticket with 37,043 votes. BSP’s Rampati Ranjan had got 20,481 votes. At the Chatra Lok Sabha Constituency, under which there is Latehar district, the BJP’s S.N. Singh won with 295,862 votes, followed by Dhiraj Prasad Sahu with 117,836 votes, followed by Nilam Devi of JVM with 104,176 votes. Then there was AJSU Party with 35,674, Samajwadi Party with 29,754, Communist Party of India with 21,261, Aam Aadmi Party with 17,980, Bahujan Samaj Party 14,929, Rashtriya Deshaj Party with 10,771, Communist Party of India (Marxist-Leninist) with 8341, and All India Trinamool Congress with 7841. The line at Mayapur polling station in Chainpur block of Palamau District at Jharkhand on the 10th of April, 2014. Polling station at Gore Panchayat, closer to the town of Daltonganj at Palamau District on the 10th of April, 2014. Memorial for Vijay Kumar Prasad, the driver killed along with two CRPF personnel in an IED blast on the 15th of April, 2009. Inside the polling booth at Uldanda Panchayat at Palamau district of Jharkhand on the 10th of April, 2014. The MNREGA office at Kachanpur village at Palamau district of Jharkhand. Abandoned government offices for the Mandal dam at Latehar district of Jharkhand. Scene from outside the polling center at Daltonganj, Palamau, at the end of polling. You are currently browsing the archives for the Lok Sabha Elections category.